I am reading the wonderful author Donald Richie’s The Inland Sea, first published in 1971. Richie is the ultimate American expat in Japan, who stayed from the start of the Occupation until today, and this is a classic travel book focused on Seto Nai Kai (the Inland Sea), which I recently visited. This passage struck me because Ginza Farm, which I have visited for Tokyo Green Space, overcomes the division between city and country by bringing a rice paddy to Ginza, Tokyo’s most celebrated commercial district full of De Beers, Cartier and now of course Uniqlo flagship stores. Richie’s The Inland Sea also reminds me of the recently deceased French anthropologist Claude Levi-Strauss’ Tristes Tropiques, which chronicled an Amazon on the verge of extinction. In a similar voyage by boat, Richie bemoans the new highways and lure of the city that threaten the fishing economy and general isolation of these islands and peoples. What used to be called “salvage anthropology” clashes with contemporary feelings by focusing on purity and what is about to be lost. This antique attitude also portrays the writer as both the “first” and last foreigner to capture a vanishing culture, creating a false sense of importance for the individual writer. Despite this unease, it is hard not to enjoy Richie’s beautiful writing, his insights on insider and outsider culture, and his only partly closeted attraction to Japan. And I do not doubt the gulf that once existed between city and country, which makes the current urban interest in rural life and agriculture all the more indicative of profound social and environmental change. On a related topic, I read this week in the New York Times that Korea, which is generally more accepting of national diversity, is having difficulties integrating children of mixed marriages. Most mixed children are the progeny of Korean farmers and their Chinese, Filipino and Thai wives. Partly the social question is of race, but also of class and city versus country. I was struck that Korea shares Japan’s rural abandonment, and seems ahead of Japan in responding through immigration. Perhaps Japan, too, will first open its doors to immigrants willing to live in its rural areas now inhabited almost exclusively by the elderly. Despite Japan’s xenophobia, immigrants as care-givers and farmers seem more likely than the techno fantasy of robots: more cost-effective as workers and more human in terms of care and culture. The Japan Times published my op-ed article “Tokyo’s urban design role.” My argument is that Tokyo’s past urban design failures paradoxically make it a model for rebuilding existing cities and designing hundreds of emerging cities. In the context of climate change and global warming, livable cities can create a new balance between people and nature. I talk about fireflies, Ginza rice and honeybees, modern bonsai, satoyama in the city, businesses and biodiversity, and how Japan can promote innovations in urban life, alongside achievements in popular culture and high technology. Much of Tokyo is covered in concrete and pavement. In the photo above, a low traffic small street has impermeable pavement. There is a wide, unnecessary brick sidewalk in the foreground built to accompany a recent apartment building. Two private residences also have concrete car-parks and cement surrounds. If you look very closely, to the left of the red traffic cone, a canna flower is breaking through the concrete and blooming. Up close, the flower is brilliant on a sunny November day. Even more remarkable is that the plant has somehow managed to break through the pavement. How did it get there? How does it survive the city’s relentless drive to bury every grain of soil? Do the neighbors appreciate this floral beauty and the power of nature over the built environment? After the jump, a closer view of the plant in its context. Next Wednesday night (December 2) I will be speaking at Pecha Kucha night in Tokyo (click for map). The event brings together the widest possible variety of designers– including architects, fine artists, crafts, graphic designers, illustrators, and other creative types. Pecha Kucha’s name comes from the Japanese phrase for “chit chat,” takes place in an informal club setting with a simple format: presenters each show 20 slides that automatically change every 20 seconds. Begun by Tokyo-based architects Astrid Klein and Mark Dytham, the event has spread to 257 cities worldwide. Some past presentations have been put online. In my 6 minutes and 40 seconds, I will try to speak half in English and half in Japanese. I hope some of my blog readers will be able to attend. Recently I met with Yamada Yoriyuki (山田順之), Manager of the Office of Global Environment at constructino company Kajima and a leader in bringing biodiversity ideas to Japanese corporations. He showed me the new interactive illustration Kajima created of an integrated sustainable city, where bees pollinate community gardens, school fields are mowed by goats, falcons provide crow control, rivers support animal life, hospitals have healing gardens, and plants and animals contribute to a better environment. Yamada’s vision for new urbanism is holistic, with the widest variety of wildlife improving human life. Contrary to the government’s minimal regulations, Yamada boldly states, “I am not interested in greening.” Instead of applying green to existing projects, Yamada emphasizes habitat and culture. Habitat requires links between insects and birds, bees and food, trees and birds, clean water and fish. As an anthropologist, I was also pleased to hear Yamada emphasize culture as key to creating social change in cities. Yamada cites the importance of “eight million kami” (ya-o-yorozu no kami or 八百万の神), a Shinto belief in animism and the presence of spirits in an infinite number of natural beings and materials. In addition to working with Kajima and the Japanese Business Initiative for Biodiversity, Yamada is very hands-on. He explained how he monitors honeybees on Kajima’s Ikebukuro dormitory using GPS and biking along a 2 kilometer radius. From his observations, he sees urban honeybees avoiding park and street trees because pesticides have made them unsafe, and preferring instead small gardens grown by residents. Yamada also cites the Japanese Pygmy Woodpecker as a key indicator species. Because it travels relatively short distance, urban habitat requires a series of interconnected parks and street trees creating a green web. I find this idea of the ecological connection between large public spaces and individual gardens very inspiring. I also highly recommend the article he co-authored: Kumagai, Yoichi and Yoriyuki Yamada. “Green Space Relations with Residential Values in Downtown Tokyo: Implications for Urban Biodiversity Conservation.” Local Environment, Routledge Press, Vol. 13, No. 2, 141–157, March 2008. Edible walls are a new idea alongside green roofs and green walls: maximizing urban space for plants and food. A New York Times article discuss how a collaborations between garden designers and a metal fabricator to create relatively simple soil and drip water systems that support lettuce, tomatoes, cucumbers, bell peppers, spinach, leeks, and even baby watermelon. The article mentions an antecedent in espaliered fruit trees in European cities during the Middle Ages. Recently, edible walls are being used in a Los Angeles homeless shelter to feed the residents and generate a small income. In front of Shinjuku’s Opera City, a high rise office tower with cultural facilities including theaters and a museum, four levels of stacked freeways cast shadows, pollute the air, and block pedestrian space with giant concrete support columns. The presence of even one elevated freeway undermines pedestrian life and divides neighborhoods. Are all the elevated freeways necessary for Tokyo? I visited Odakyu’s Agris Seijo rental farm in Seijogakuenmae in Setagaya and was prepared to be charmed by a community vegetable farm built by a rail company above their tracks. Three years ago, the Odakyu corporation rebuilt the station, undergrounded the railway, and used some of the new land to promote urban farming. But I left feeling somewhat strange that reclaimed land could be gated and restricted. Although it is the rail company’s property, I think they missed a huge opportunity to create a great space for the neighborhood. The farm is entered through a two story building that has a plant store on the first floor, spilling into the sidewalk, and a club room on the second floor. On entering the building, I learned that the garden was gated, and that no photographs were allowed. With my Tokyo University of Agriculture business card, I was handed a visitor’s pass. Two explanations were given about the no photography policy: customers would be concerned about their privacy, and photographers might misrepresent the photos they take. Please note that all the photos in this post were all taken from public roadways outside the gates. Once inside, I discovered that this Agris Seijo has 303 rental plots, ranging in price between 5,500 and 14,500 yen per month ($60 to $175) depending on size and sunlight. 70% of the plots are being used, and the farm is organized in two seasons, with a fallow period during winter. Many of the customers are first time vegetable growers, and there are classes and staff to help them. Some of what I observed: an elderly man harvesting giant sweet potatoes. Attractive netting with metallic strips to deter birds and insects. Some very attractive plots with broccoli, rainbow chard, carrots, celery, lettuce, salty leaf, peppers, basil, cauliflower, onion, eggplant, daikon radish. Clearly burying the tracks below grade reduces railway noise for the neighbors and adds soil and plants which benefits the environment. There are benefits for customers and neighbors. Yet, I was struck by how empty the farm was during my weekday visit, and wondered why only 70% of the plots are rented after three years of operation. I also wonder if the customers or the railway company owner feels more special or important because of the gated aspect of the garden. In a city that is remarkably safe, I cannot imagine why there is a real need for keeping people out. This wealthy project reminds me of the community garden I observed in Tsukushima. There, neighbors invested great time and effort in making beautiful spaces on an existing concrete river embankment. It appears that each gardener is expressing their own passions and perhaps competing with their neighbors. At no cost to the local government, neighbors have beautified dead space which can now be enjoyed by anyone. The Tsukushima community garden is completely accessible 24/7 and shows how ordinary people can create a great public space. Some more thoughts and image about Odakyu after the jump. Arriving at Gardex, the International Garden Expo Tokyo, was a bit of a shock. First, I could not believe how far it was from Tokyo. Past Disney. Past IKEA. Past Costco. Gardex occupied a portion of one of the five mega-halls. The first impression was overwhelming: a hum of electricity and a burst of fluorescent lighting animating a trade show as removed from nature as possible. The first booth we passed promoted a pesticide company. Spray bottles seemed to float above colorful flowers, a salesperson spoke with much animation into a wireless mic, and lighted towers offered multiples of each product. The photo mural and garish colors seem to contradict the “natural safety” message. Click below to read and see more about industrial gardening, a cool vertical garden product, and global business. With a few minutes to spare before meeting Hiraga Tatsuya of Landscape+, I stepped into nearby Shin Edogawa park. The colors were beautiful, and empty apart from a couple having formal wedding photos taken in traditional costume. I wonder what the small seasonal sculpture is. There were several placed in the garden, and they seem to be made of rice stalks, and possibly with a religious meaning. Please let me know if you know. Here’s a close-up. And another garden photo after the jump. The weather is turning very cold in Tokyo, the leaves are turning color and fall camellias are now in bloom. This bright pink “sazanka” (サザンカ) surprised me on my walk through Koenji. Below you can see the context of this unexpected pleasure. On my way to Temple University, I passed the Sannohashi bridge, and realized that the river was almost completely covered by an elevated freeway. Later I learned the river is called Furukawa (古川), an extension of the Shibuyakawa. The freeway destroys all the life the river could support, and also diminishes the value of the houses left in its shadows. This is just one of many Tokyo rivers, canals and historic bridges buried by freeways. A hopeful vision of what could be is seen in the “daylighting” of Seoul’s Cheonggyecheon (Hangul: 청계천) river. As it is now, what remains of the river is a dead space created through poor planning. 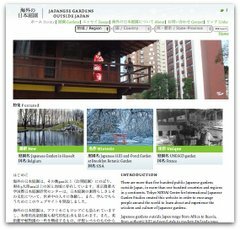 The Tokyo Metropolitan Government’s Bureau of Construction has a cool interactive map showing every bridge of this river, with photos of each bridge and the views upstream and downstream. And there are photos of this river during Edo, Meiji and contemporary times. For an American, it is shocking to see how frequently all the Japanese transit lines advertise the lovely, and often seasonal places, they will take you. In the United States, taking transit almost always signifies necessity, poverty and routine. The JR station poster above shows happy urbanites and young workers (signified by their white towels) with the headline “I like the Chuo line.” In small print, they explain that you can take the Chuo to Mitaka in western Tokyo and participate in kiwi picking. On a cold day, this station ad seemed sunny and hopeful.